1 Lightly mash beans in medium bowl. Stir in tuna, Hellmann's® or Best Foods® Mayonnaise Dressing with Olive Oil, lemon juice and salt. 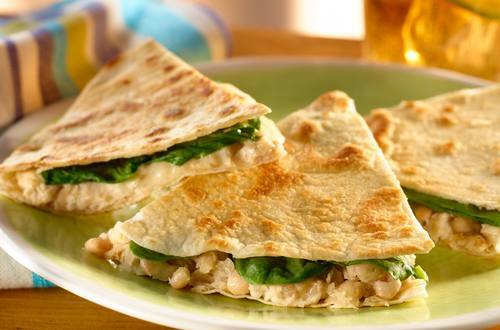 Evenly spread tuna salad onto 2 tortillas, then top with cheese, spinach and remaining tortillas. 2 Grill, turning once, 3 minutes or until golden and cheese is melted. Cut into wedges.